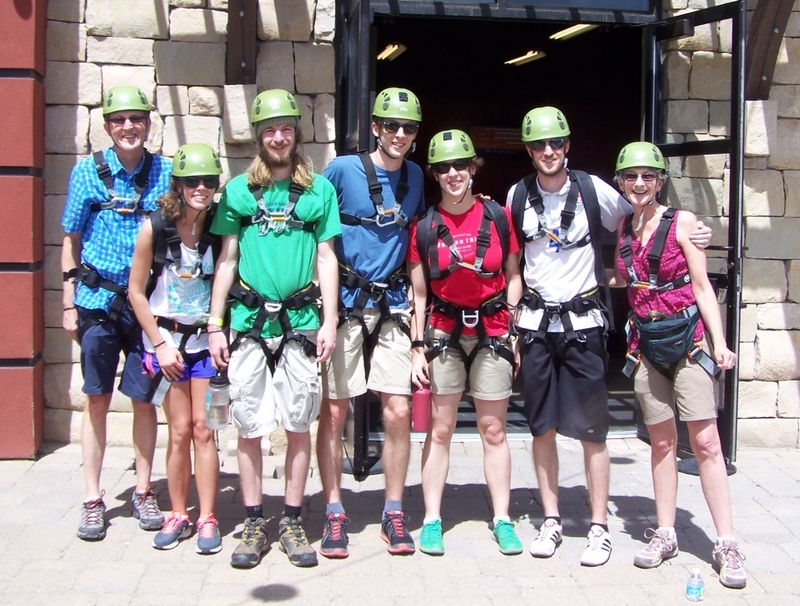 We packed up our courage Saturday morning, and set off for Canyons in Park City, Utah. We had 11:30 reservations for the ride of our lives. After getting properly equipped, we received a short course on safety. 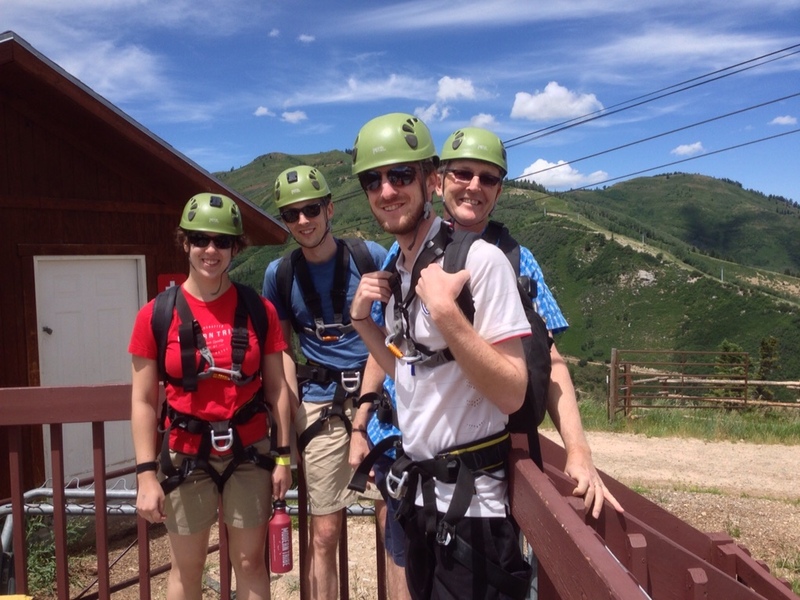 Leah, Andrew, Brad and Reg were all smiles as we reached our first zip line platform. During our lift ride up the mountain, our instructor Matt spoke enthusiastically about his job and all the improvements that are currently under construction around the Park City area. He was a great salesman…after we all successfully made our first run down the 800 foot Red Pine Zip Line, he announced that it was our last chance to upgrade to the Epic Tour. Pleased with ourselves for having conquered our first 800 foot zip and feeling a little cocky, we all accepted the challenge and signed on to ride down the Lookout zip line, a 2,111 foot drop over the treetops above Lookout Canyon. 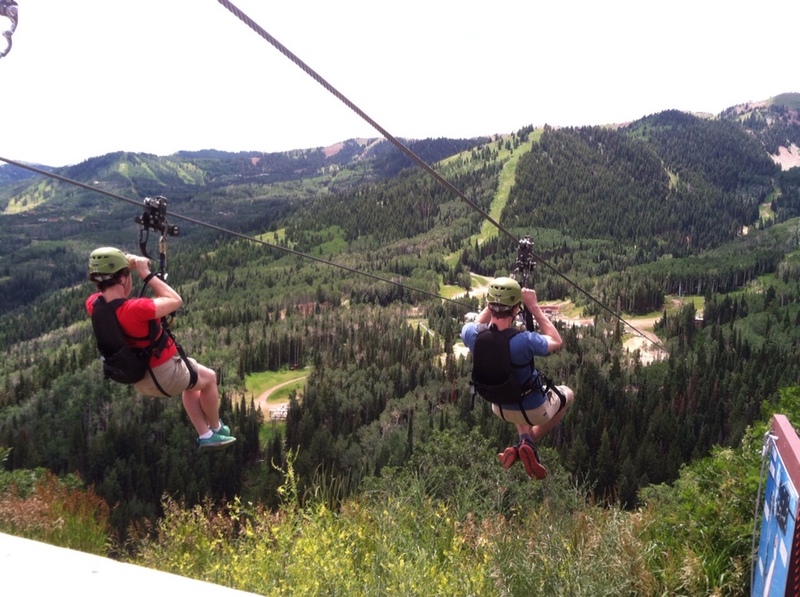 Andrew and Leah bravely volunteered to be first to zip over Lookout Canyon. We tried to post a video of us going down the zip line, but it didn’t work out. It was a great ride! Hauling that zip line equipment around at 7,000 feet was quite the workout! So glad we lived to tell the tale! Park City must look very different to you in the summer. Hugs across the miles from us both!